Unique views of a stunning partial solar eclipse were captured by two separate satellites in a series of breathtaking images of the sun, moon and Earth as they briefly aligned in the cosmos earlier this month. 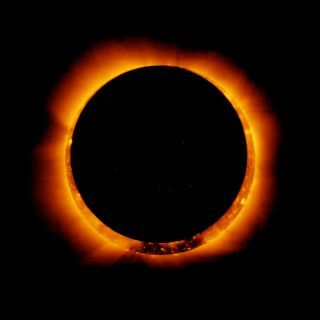 On Jan. 4, the Japanese Hinode satellite and the European Space Agency's Proba-2 microsatellite witnessed what is known as an annular solar eclipse. This phenomenon occurs when the moon, slightly more distant from Earth than usual, moves directly between Earth and the sun, but appears slightly smaller to observers' eyes. The effect is a bright ring, or annulus of sunlight, around the silhouette of the moon. The Japanese-American Hinode satellite witnessed an annular solar eclipse on Jan. 4, 2011. The Hinode satellite, which launched in September 2006, is a Japanese mission with international partners, including NASA, the European Space Agency and the U.K.-based Science and Technology Facilities Council. The satellite is currently in Earth orbit, and its mission is to study the magnetic energy of the sun to improve our understanding of the mechanisms that power the solar atmosphere and drive solar eruptions. Hinode uses three advanced solar telescopes that study the generation, transport, and dissipation of magnetic energy from the sun's photosphere to the corona, and will record how energy stored in the sun's magnetic field is released, either gradually or violently, as the field rises into the sun’s outer atmosphere. Turbulent solar eruptions can have an impact on hardware and life on Earth. ESA's sun-watching Proba-2 satellite also caught the Jan. 4 partial solar eclipse. Shortly after the moon partially blocked Proba-2's view of the sun, the satellite flew into Earth's shadow, relaying a spectacular set of images as the three bodies aligned. "This is a notable event," said Bogdan Nicula of the Royal Observatory of Belgium (ROB), who calculated where and when this double eclipse would occur. "It is a nice exercise to model the orbit and relative positions of all three celestial bodies." A European Space Agency microsatellite, called Proba-2, caught this view of the Jan. 4, 2011 partial solar eclipse, just before the Earth's atmosphere intervened. After Proba-2 passed through Earth's shadow, the microsatellite saw a brightening sun, signifying the orbital point when the moon was no longer eclipsing the sun. "We had to work very hard to get this high-resolution pointing needed for these images," said David Berghmans, principal investigator of Proba-2's SWAP imager, which is designed and operated by ROB. "And, as far as I am aware, the Mayans did not predict this alignment should cause concerns!" The Proba-2 microsatellite's main function is to observe the sun, but for part of the winter season, it experiences sunsets and sunrises, with Earth starting to obstruct Proba-2's view of the sun for a few minutes per orbit. The satellite is less than a cubic meter in volume, and its SWAP imager is roughly the size of a large shoe box. ESA's upcoming Proba-3 mission, currently scheduled for 2015 to 2016, will be made up of two formation flying satellites, with one casting the other into shadow to allow for continuous observation of the faint outer layers of the still-mysterious solar corona.